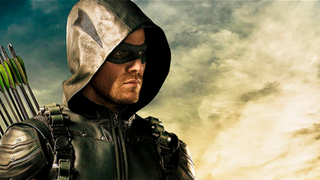 When Arrow first began, it was reticent to show off its comic past—Oliver Queen was a snarly Batman-type, the Green Arrow became “The Hood” and “The Vigilante”, and Star City became Starling. But as the show increasingly embraces its roots, those things have changed (okay, not Ollie)—and now the city has too. By the way, CW, I’ll take that Lance/Diggle buddy cop spinoff show yesterday, please and thank you. It’s nice to see that the show is finally embracing its comic-bookness whole hog—a move presumably inspired by its wonderful sibling The Flash going comic book bonkers from pretty much episode one—but this actually isn’t the first time the show has floated the idea. Part of Ray Palmer’s pitch for rebuilding Queen Consolidated as Palmer Technologies in season 3 was rebranding Starling to Star City, mainly to get over the fact no one wants to live in a city constantly, ceaselessly under attack from supervillain terrorist loonies and whatnot. At the same time though, it’s kind of insane that they’re changing the name of a whole damn city and just brushing it off as an in-between-seasons sort of thing. It’s actually quite hard to change a city’s name—and also surprisingly rare. Like, think of all the rebranding services like the Police and Fire Departments have to go through. Think about being suddenly told the city you’ve lived your entire life in is suddenly named something else (and it’s not like any of the characters can go, “Well, you see, there’s this comic book...” for an explanation)! Is it weird I want scenes of the legal process for this? Fewer arrows, more LEGAL PROCESSES. That’s the key to Arrow’s success, right?